Glycolysis is the metabolic process that serves as the foundation for both aerobic and anaerobic cellular respiration. In glycolysis, glucose is converted into pyruvate. Glucose is a six- memebered ring molecule found in the blood and is usually a result of the breakdown of carbohydrates into sugars. It enters cells through specific transporter proteins that move it from outside the cell into the cell’s cytosol. All of the glycolytic enzymes are found in the cytosol. Here, the glucose ring is phosphorylated. Phosphorylation is the process of adding a phosphate group to a molecule derived from ATP. As a result, at this point in glycolysis, 1 molecule of ATP has been consumed. The reaction occurs with the help of the enzyme hexokinase, an enzyme that catalyzes the phosphorylation of many six-membered glucose-like ring structures. Atomic magnesium (Mg) is also involved to help shield the negative charges from the phosphate groups on the ATP molecule. The result of this phosphorylation is a molecule called glucose-6-phosphate (G6P), thusly called because the 6′ carbon of the glucose acquires the phosphate group. 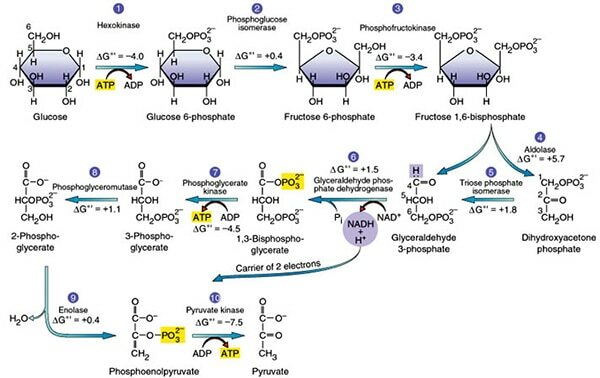 The second step of glycolysis involves the conversion of glucose-6-phosphate to fructose-6-phosphate (F6P). This reaction occurs with the help of the enzyme phosphoglucose isomerase (PI). As the name of the enzyme suggests, this reaction involves an isomerization reaction. The reaction involves the rearrangement of the carbon-oxygen bond to transform the six-membered ring into a five-membered ring. To rearrangement takes place when the six-membered ring opens and then closes in such a way that the first carbon becomes now external to the ring. In the third step of glycolysis, fructose-6-phosphate is converted to fructose- 1,6-bisphosphate (FBP). Similar to the reaction that occurs in step 1 of glycolysis, a second molecule of ATP provides the phosphate group that is added on to the F6P molecule. The enzyme that catalyzes this reaction is phosphofructokinase (PFK). As in step 1, a magnesium atom is involved to help shield negative charges. This step utilizes the enzyme aldolase, which catalyzes the cleavage of FBP to yield two 3-carbon molecules. One of these molecules is called glyceraldehyde-3-phosphate (GAP) and the other is called dihydroxyacetone phosphate (DHAP). GAP is the only molecule that continues in the glycolytic pathway. As a result, all of the DHAP molecules produced are further acted on by the enzyme triphoshpate isomerase (TIM), which reorganizes the DHAP into GAP so it can continue in glycolysis. At this point in the glycolytic pathway, we have two 3-carbon molecules, but have not yet fully converted glucose into pyruvate. In this step, two main events take place: 1) glyceraldehyde-3-phosphate is oxidized by the coenzyme nicotinamide adenine dinucleotide (NAD); 2) the molecule is phosphorylated by the addition of a free phosphate group. The enzyme that catalyzes this reaction is glyceraldehyde-3-phosphate dehydrogenase (GAPDH). The enzyme GAPDH contains appropriate structures and holds the molecule in a conformation such that it allows the NAD molecule to pull a hydrogen off the GAP, converting the NAD to NADH. The phosphate group then attacks the GAP molecule and releases it from the enzyme to yield 1,3 bisphoglycerate, NADH, and a hydrogen atom. In this step, 1,3 bisphoglycerate is converted to 3-phosphoglycerate by the enzyme phosphoglycerate kinase (PGK). This reaction involves the loss of a phosphate group from the starting material. The phosphate is transferred to a molecule of ADP that yields our first molecule of ATP. Since we actually have two molecules of 1,3 bisphoglycerate (because there were two 3-carbon products from stage 1 of glycolysis), we actually synthesize two molecules of ATP at this step. With this synthesis of ATP, we have cancelled the first two molecules of ATP that we used, leaving us with a net of 0 ATP molecules up to this stage of glycolysis. Again, we see that an atom of magnesium is involved to shield the negative charges on the phosphate groups of the ATP molecule. This step involves a simple rearrangement of the position of the phosphate group on the 3 phosphoglycerate molecule, making it 2 phosphoglycerate. The molecule responsible for catalyzing this reaction is called phosphoglycerate mutase (PGM). A mutase is an enzyme that catalyzes the transfer of a functional group from one position on a molecule to another. The reaction mechanism proceeds by first adding an additional phosphate group to the 2′ position of the 3 phosphoglycerate. The enzyme then removes the phosphate from the 3′ position leaving just the 2′ phosphate, and thus yielding 2 phsophoglycerate. In this way, the enzyme is also restored to its original, phosphorylated state. This step involves the conversion of 2 phosphoglycerate to phosphoenolpyruvate (PEP). The reaction is catalyzed by the enzyme enolase. Enolase works by removing a water group, or dehydrating the 2 phosphoglycerate. The specificity of the enzyme pocket allows for the reaction to occur through a series of steps too complicated to cover here. The final step of glycolysis converts phosphoenolpyruvate into pyruvate with the help of the enzyme pyruvate kinase. As the enzyme’s name suggests, this reaction involves the transfer of a phosphate group. The phosphate group attached to the 2′ carbon of the PEP is transferred to a molecule of ADP, yielding ATP. Again, since there are two molecules of PEP, here we actually generate 2 ATP molecules. Net “visible” ATP produced = 2. Immediately upon finishing glycolysis, the cell must continue respiration in either an aerobic or anaerobic direction; this choice is made based on the circumstances of the particular cell. A cell that can perform aerobic respiration and which finds itself in the presence of oxygen will continue on to the aerobic citric acid cycle in the mitochondria. If a cell able to perform aerobic respiration is in a situation where there is no oxygen (such as muscles under extreme exertion), it will move into a type of anaerobic respiration called homolactic fermentation. Some cells such as yeast are unable to carry out aerobic respiration and will automatically move into a type of anaerobic respiration called alcoholic fermentation. Thank God I came across this.. Best one I’ve read on Glycolysis so far.. Even better than my textbooks.. Were do the other hydrogens goes after the splitting of fructose in step 4? when one AtP molecules is produce and other one is consumed so what effect on glycolysis??? In the last step where phosphoenol pyruvate is converted to pyruvic acid! Where is the Hydrogen atom coming from? I’ve searched and searched for the easiest to understand discussion about Glycolysis and I was not disappointed by the way you presented the complexity of the process. (Honestly, I can feel how you really want to let the readers understand the concepts in a friendly language to help them keep up with every step.) Thanks a lot! Pls help me and explain how fruit you just taken will enter into glycolytic pathway. most of the fruits you eat will breakdown as simpler substances so that cell can consume it. in further processes glucose will be converted to pyruvate.In simple words most of the food items contains glucose or its combined forms like sucrose .etc.when you eat an apple you are taking in glucose .glycolytic cycle occurs in cell organelles like mitochondria .etc.these all happens the very moment when something reaches your stomach. dear thanks for making it easy. pls can you simplify electron transport chain/ oxidative phosphorylation. I don’t actually knows how to express to you my thanks, because the way you splits, disintegrates, and break down this glycolic pathway I’m so impressed. To be honest before I found this, I suffered a lot on how to understand this thing.Because I didn’t attends the lectures at school when the lecturer is conducting it. But now I’m fully convinced and fully understand it. Thank You so much. Do you have the same excelently written Krebs Cycle as you have done in the glycolisis cycle ?. You have done an outstanding job. Kindly describe the process in the mitochondria as well. Also please do the same for gluconeogenesis, glycogenesis and glucogenolysis. I like the way all the steps have been outlined for easy understanding. I found this very helpful. With some level of effort, I now have all the 10 steps on my finger tips for my biochemistry class. Thank you so much for sharing. I have a doubt,from where does the phosphate in step 6 come from? It just says that phosphate is added. Anyway the answer was useful,Thank you! it would have been much better if the energy released or absorbed at each stage was included. I don’t understand the role of magnesium, can you explain it more clearly? The role is clear that it shields the highly reactive negative charge phosphate from reacting with ADP molecules but how does the cofactor and enzyme distinguish between ADP and ATP when both have a difference of one phosphate group. Good discussion , I was enlightened by the specifics , Does anyone know if I could acquire a blank WI WB-42 example to use ? since there were two molecules of PEP,was two molecules of pyruvate compound formed? yeah, two molecules of pyruvate are formed and they all jump into citric acid cycle(kreb cycle) with the help of pyruvate dehydrogenase. now this is the best thing i have read so far on glycolysis.even my text book can’t explain it well.thank you very much. Archea can srvive in harsh environmenatl conditions because of its specific Cell wall and cell membrane compositions. Thanx for the illustration. I have a query regarding structure of glucose. You have placed hydroxyl group in structure of glucose down in first carbon. Same is the case in second carbon, but you have placed hydroxyl group in third carbon up. Does it have to be so specific? I mean, cant we place hydroxyl group in first carbon up or hydroxyl group in third carbon down? I have save same question regarding placement of hydroxyl group in 3 carbon structures ie left or right. In aerobic glucose metabolism, the oxidation of citric acid uses ADP and Mg²+, which will increase the speed of reaction: Iso-citric acid + NADP (NAD) — isocitrate dehydrogenase (IDH) = alpha-ketoglutaric acid. In the Krebs cycle (the citric cycle), IDH1 and IDH2 are NADP+-dependent enzymes that normally catalyze the inter-conversion of D-isocitrate and alpha-ketoglutarate (α-KG). The DH1 and IDH2 genes are mutated in > 75% of different malignant diseases. Two distinct alterations are caused by tumor-derived mutations in IDH1 or IDH2: loss of its normal catalytic activity during the production of α-ketoglutarate (α-KG) and the gain of catalytic activity to produce 2-hydroxygulatrate (2-HG). This product is a competitive inhibitor of multiple α-KG-dependent dioxygenases, including histone, demethylases, prolyl-4-hydroxylase and the TET enzymes family (Ten-Eleven Translocation-2), resulting in genome-wide alternations in histones and DNA methylation. IDH1 and IDH2 mutations have been observed in myeloid malignancies, including de novo and secondary AML (15%–30%), and pre-leukemic clone malignancies, including myelodysplastic syndrome and myeloproliferative neoplasms (85% of the chronic phase and 20% of transformed cases in acute leukemia). The energetic sum of anaerobic glycolysis is ΔGo = -34.64 kcal/mol. However, a glucose molecule contains 686 kcal/mol and the energy difference (654.51 kcal) remains a potential for un-controlled reactions in carcinogenesis. The transfer of electrons from NADPH in each place of the conserved unit of energy transmits conformational exchanges of mitochondrial ATPases. In the reaction, ADP³+ P²¯ + H²– ATP + H2O it is a reversible reaction. The terminal oxygen from ADP binds the atom P2¯ by forming an intermediate pentacovalent length and synthesizing the molecular complexes ATP and H2O. This reaction requires Mg²+ and ATP-synthetase, which is known as the H+-ATPase or the Fo-F1-ATPase complex, where FO is a conductor proton and F1 is synthesized. Mg2+ stabilizes the mitochondrial membrane via the high electronegativity of its electrons. In contrast, intracellular calcium induces mitochondrial swelling and aging. Mg2+ generally interacts with substrates via the inner coordination sphere, stabilizing anions or reactive intermediates, binding ATP and activating the molecule for nucleophilic attack. I’m glad to see this post, as a student of nutrition for better health and aging. How does this relate to Diabetes? Can you connect the dot for the general public? I’ve read dozens of books on diet and nutrition, but only getting confused, without conceptual biological-chemical bases to validate many contradictory claims. I am glad to see that you included the delta-G values in the principal figure. These are very important for helping students appreciate how the flow operates in these pathways, but the values are often left out of figures for the sake of simplicity. At the same time, I would recommend adding arrows for the reverse reactions, perhaps with length indicating the free energy vector, to further emphasize and distinguish the freely reversible from essentially irreversible reactions. It might also help to add both the free energy values and the reverse arrows to the single-step figures, as well. Overall, this is a pretty good study review.